Jews living in the Diaspora form a very small proportion of the total population in all countries without an exception. This situation (‘the rarity problem’) presents a major obstacle to survey taking among Jews: Jews are nearly impossible to capture in numbers conducive to statistical analysis in regular national sample surveys. Various probability-based sampling methods have been applied in the context of Jewish surveys. The key development in the field of Jewish social surveys in Europe, however, is the shift from probability sampling to methods that are reliant on non-probability sampling, either partially or exclusively. Can the insights produced by such samples be trusted? To what extent can they be understood, by academics and policy makers, as a true representation of the realities lived through by contemporary European Jewish populations? These questions are empirically investigated using the FRA 2012 survey - the first cross-European survey of Jewish perceptions and experiences of antisemitism conducted by the European Union Agency for Fundamental Rights, the Institute for Jewish Policy Research and polling agency IPSOS Mori in 2012. Becher, H., S. Waterman, B. Kosmin, and K. Thomson. 2002. A portrait of Jews in London and the South-East: a community study. JPR Report. No. 4, 2002. http://www.jpr.org.uk/documents/A%20portrait%20of%20Jews%20in%20London%20and%20the%20South-East.pdf. Campaign Against Antisemitism. 2017. Antisemitism Barometer 2017. London: Campaign Against Antisemitism.https://antisemitism.uk/wp-content/uploads/2017/08/Antisemitism-Barometer-2017.pdf. Casale Mashiah, D., and J. Boyd. 2017. Synagogue membership report in the United Kingdom in 2016. JPR Report, July 2017. http://www.jpr.org.uk/documents/Synagogue_membership_in_the_United_Kingdom_in_2016.pdf. Cohen, E.H. 2009. The Jews of France at the turn of the third millennium: a sociological and cultural analysis. Bar-Ilan University-Faculty of Jewish Studies: The Rappaport Center for Assimilation Research and Strengthening Jewish Vitality.https://www.rappaportcenter.biu.ac.il/Research/PDF/Hoveret_19-corrected9.11.09.pdf. DellaPergola, S., and L.D. Staetsky. 2015. From old and new directions: perceptions and experiences of antisemitism among Jews in Italy. JPR Report. February 2015. http://www.jpr.org.uk/documents/Perceptions_and_experiences_of_antisemitism_among_Jews_in_Italy.pdf. DellaPergola, S. 2016. World Jewish population, 2016. Current Jewish Population Reports 17-2016. Berman Jewish DataBank.http://www.jewishdatabank.org/Studies/downloadFile.cfm?FileID=3584. Dencik, L., and K. Marosi. 2017. Different antisemitisms: perceptions and experiences of antisemitism among Jews in Sweden and across Europe. JPR Report. February 2017. http://www.jpr.org.uk/documents/JPR_2017._Different_Antisemitisms_in_Sweden_and_across_Europe.pdf. Graham, D., and J. Boyd. 2010. Committed, concerned and conciliatory: the attitudes of Jews in Britain towards Israel: initial findings from the 2010 Israel survey. JPR Report. July 2010. http://www.jpr.org.uk/documents/Committed,%20concerned%20and%20conciliatory:%20The%20attitudes%20of%20Jews%20in%20Britain%20towards%20Israel.pdf. Graham, D., L.D. Staetsky, and J. Boyd. 2014. Jews in the United Kingdom in 2013: preliminary findings from the National Jewish Community Survey. JPR Report, February 2014. http://www.jpr.org.uk/documents/JPR_Jews_in_the_UK_in_2013_NJCS_preliminary_findings.Feb.%202014.pdf. Graham, D. 2016. Jews in couples: marriage, intermarriage, cohabitation and divorce in Britain. JPR Report, July 2016. http://www.jpr.org.uk/documents/JPR_2016.Jews_in_couples.Marriage_intermarriage_cohabitation_and_divroce_in_Britain.July_2016.pdf. Graham, D. 2018. European Jewish identity: mosaic or monolith? An empirical assessment of eight European countries. JPR Report, April 2018. http://www.jpr.org.uk/documents/JPR.2018.European_Jewish_identity.Mosaic_or_Monolith.pdf. IFOP. 2015. Enquête auprès des juifs de France. Ifop pour la Fondation Jean Jaurès. JF N 113132, September 2015. http://www.ifop.fr/media/pressdocument/883-1-document_file.pdf. JDC International Centre for Community Development. 2011. Identity a la Carte: research on Jewish identities, participation and affiliation in five Eastern European countries. Oxford: JDC International Centre for Community Development. http://www.jdc-iccd.org/wp-content/uploads/2017/11/Survey-Eastern-European-Jews-Identity-a-la-carte.pdf. Kovacs. A. 2004. 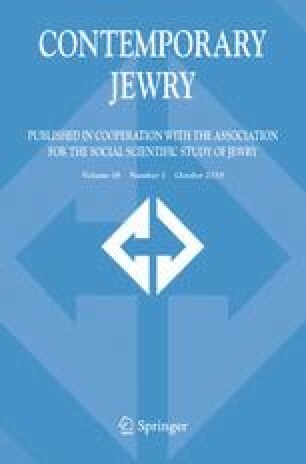 Jews and Jewry in contemporary Hungary: results of a sociological survey. JPR Report. No 1. 2004. (Planning for Jewish Communities series). http://www.jpr.org.uk/documents/Jews%20and%20Jewry%20in%20contemporary%20Hungary.pdf. Miller, S., M. Schmool, and A. Lerman. 1996. Social and political attitudes of British Jews: some key findings of the JPR survey. JPR Report. Institute for Jewish Policy Research. No 1, February 1996. http://www.jpr.org.uk/documents/Social%20and%20political%20attitudes%20of%20British%20Jews:%20Some%20key%20findings%20of%20the%20JPR%20survey.pdf. Miller, S., M. Harris, and C. Shindler. 2015. The attitudes of British Jews towards Israel. London: Department of Sociology, School of Arts and Social Sciences, City University. http://yachad.org.uk/wp-content/uploads/2015/11/British-Jewish-Attitudes-Towards-Israel-Yachad-Ipsos-Mori-Nov-2015.pdf. Pew Research Center. 2013. A portrait of Jewish Americans. October 2013. http://www.pewforum.org/2013/10/01/chapter-4-religious-beliefs-and-practices/. Pew Research Center. 2016. Israel’s religiously divided society. http://www.pewforum.org/2016/03/08/identity/. Staetsky, L.D., and J. Boyd. 2014. The exceptional case? Perceptions and experiences of antisemitism among Jews in the United Kingdom. JPR Report, July 2014. http://www.jpr.org.uk/documents/Perceptions_and_experiences_of_antisemitism_among_Jews_in_UK.pdf. Teinturier, B., and E. Mercier. 2016. Perceptions et attentes de la population juive. La rapport a l’autre et aux minorites. IPSOS Public Affairs and Fondation du JudaismeFrancaise. https://harissa.com/images/presentation_globale.pdf. Zentralwohlfahrtsstelle der Juden in Deutschland (ZWST). 2013. Mitgliederstatistik der judischen gemeinden und landesverbande in Deutschland fur das jahr 2012. Frankfurt am Main: Zentralwohlfahrtsstelle der Juden in Deutschland e. V.https://www.zwst.org/de/service/mitgliederstatistik/. Zick, A., A. Hovermann, S. Jensen, and J. Bernstein. 2017. Jüdische Perspektiven auf Antisemitismus in Deutschland Ein Studienbericht für den Expertenrat Antisemitismus. Bielefeld: Universität Bielefeld, Institut für interdisziplinäre Konflikt- und Gewaltforschung. https://uni-bielefeld.de/ikg/daten/JuPe_Bericht_April2017.pdf.